Pallister Management : Improving company performance through quality and productivity. Leaders of growing companies: Are you struggling to meet rising customer demands AND control costs at the same time? You can have loyal customers and keep costs in line. when you give customers more your costs go up. It seems that you have to run faster just to stay in one place. Certain companies are able to meet rising customer demands and make a good profit. They have reduced the costs of their operations, improved the quality of their products and services, have retained their customers and attracted new ones. The result is profitable growth. To meet this and be profitable requires that you improve your business performance. Most companies want profitable growth but haven't addressed company's performance issues. Why not? A common reason is the that the urgent pressures of day-to-day business crowd out the important work of performance improvement. Pallister Management's business focus is helping clients meet their customers' requirements at the lowest costs consistently and profitably. 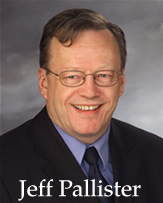 If you'd like to learn more about how we can help you, please give Jeff Pallister call. He'll be happy to discuss your situation on the phone at no charge.